Linking up with the incomparable Kelly. Day 3! How is your Lent going so far? I am so, so, so passionate about the new evangelization! I think that the day and age we are living in is a really thrilling time to be in the Church. Our faith is misunderstood and attacked from so many different sides, but we have a chance to defend it. We have a chance to show the world just how beautiful this faith of ours is. And it is truly beautiful! What is most exciting about the new evangelization, though, is the fact that we have so many tools at our disposal for spreading the news of the Gospel. Social media, if used well, can be just such a tool. Although I'm past my vocation discernment days, I still find so much inspiration in seeing other live out their vocations. Here are some of my favorite peeks into the world of the vocations of others. Imagine Sisters is another Instagram gem. I want one of those shirts so badly! Guess what?! Imagine Sisters has a YouTube channel, too! 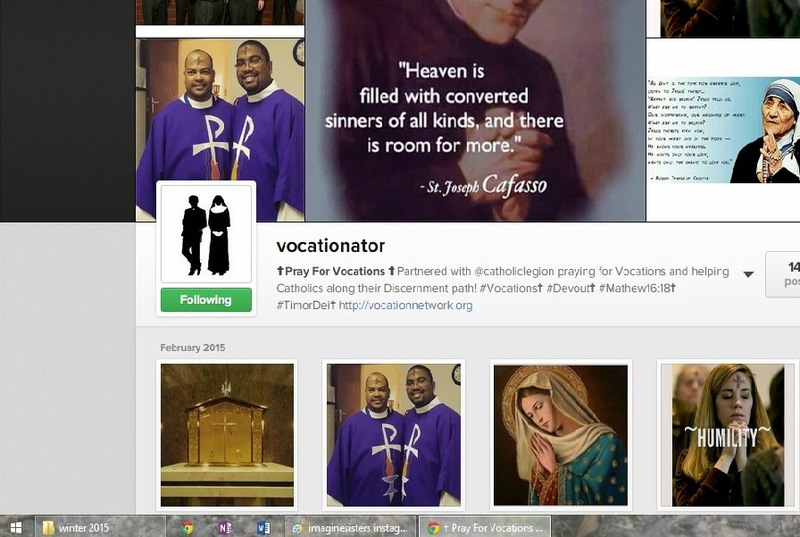 I just started following this Instagram feed because how could you not love something called "vocationator"?! This video went semi-viral not too long ago, and it just illustrates why seminarians are amazing! Did I mention that seminarians are hilarious? The seminarians of the Congregation of Holy Cross are the ones who first introduced me to the gift that seminarians are to the Church. The first ordination I ever went to was a Holy Cross ordination, and the joy was so incredibly palpable at that Mass...a little taste of heaven. (If you were wondering, this was Therese's first ordination Mass. In utero, of course. If you want to be really stalkerish, you can even see us receive Communion at 1:30:30. Sadly, I wasn't really showing yet, but our big girl was there. Promise.) The above video on final vows is stunning.